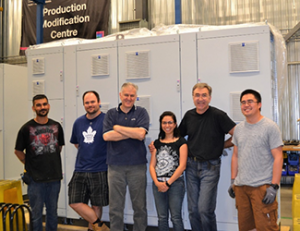 Proax then turned to Mississauga, ON-based Rittal Systems Ltd., Canada, a manufacturer of enclosures, climate control and power distribution systems, accessories and software. 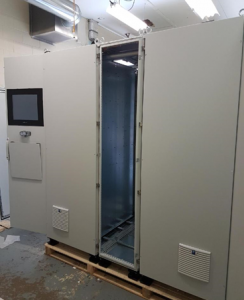 It knew that Rittal Canada has a Modification Centre located in Mississauga, with a Perforex Machine (see video below), which provides Rittal with the ability only manufacture and supply high quality products but can modify them in record time. The Perforex machine enables 10 hours of panel production work to be completed in just 90 minutes. It delivers not only time savings but increased accuracy and reduced waste with its CNC precision-capabilities. Perforex units call upon up to 20 tools in the magazine for operations including drilling tapping, milling and circular thread milling, and can handle clampable panels up to 3600 x 2300 mm. Since programming is faster than manual marking, the system is economically advantageous from a batch size of one. Perhaps most importantly, there are important design advantages inherent in Rittal enclosures that are amplified with the Perforex machining centre. Proax and Rittal put their combined expertise together to come up with an ingenious solution. Given the overall dimensions, both Paul Johnston, inside sales representative, Rittal Canada, and Craig Garbella, technical sales representative, from Rittal’s distributor, Proax Technologies, came up with a concept consisting of suiting together various TS 8 enclosures (4 enclosures – Model # 8228500, 2 enclosures – Model # 8628500, 2 enclosures – Model # 8225500, 1 enclosure – Model # 8625500). The TS 8 enclosure is Rittal’s flagship product, with more than 10 million units sold to date. Across North America and around the world, industries as diverse as oil & gas, food & beverage, water supply/wastewater management, wind power, data centres, chemicals and medical technology rely on the versatile, modular enclosure design for panel building, low-voltage switchgear, IT infrastructure and mechanical engineering applications. Highly innovative and remarkably flexible, the TS 8 is available in more than 100 versions off the shelf and comes in carbon steel, and 304 and 316 stainless steel varieties. Its modular construction allows for easy assembly, baying, equipment installations, removals and reconfigurations. Combined with Rittal’s climate control and power distribution systems, the TS 8 enclosure safely and efficiently protects electronic equipment, control and processing systems in the harshest environments, the hottest factories and the most demanding conditions while possessing a design aesthetic and surface finish worthy of showrooms. Accessories enable the TS 8 to be truly the world’s most adaptable enclosure for industrial and IT needs. Rittal’s TS 8 baying system is a system platform for just about any application. When used in conjunction with the system accessories, each enclosure is a specialist for the most exceptional tasks. The symmetrical frame profile of the TS 8 saves a significant amount of space and facilitates easy internal installation. It also allows a baying arrangement on all sides. Rittal’s Technical Service Group provided the drawings and the team worked together day and night to go from drawing board to production to finishing. Proax handled all the project planning, logistics and supply of the product seamlessly and efficiently. The solution fully satisfied the client’s requirements as not only did the combined TS 8 enclosures look aesthetically pleasing, but there was adequate space for housing, accessing and managing the cabling through the centre of the structure. Synchro Engineering has been serving southwestern Ontario with electrical engineering and contracting services since 1966. Initially incorporated as an electrical contracting firm specializing in industrial maintenance, repairs and installations, Synchro expanded its portfolio in 2006 to include electrical engineering and engineering services and has extensive experience in various fields from power systems, energy management, green energy, automation, panel builds, and equipment service, to general electrical contracting. Synchro has extended its service across a variety of fields including energy, utility, manufacturing, mining, automotive and health care. 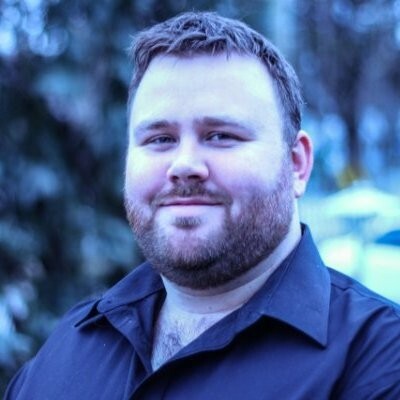 In his quest for unique and innovative solutions, Michitsch was originally looking at a custom solution to house their cable machinery leaving the centre of the cube open for cable management. Existing suppliers could not meet the specified time-line as the custom solution needed to be specifically engineered to meet the client’s requirements. For more information on the Rittal Systems Ltd., visit www.rittal.ca or contact marketing@rittal.ca. For more info on Proax Technologies, please visit www.proax.ca, or contact oakville@proax.ca.